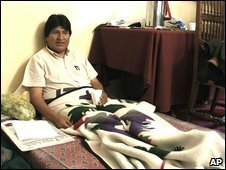 Mr Morales complains of "negligence by neoliberal lawmakers"
Bolivian President Evo Morales has said he will refuse to eat until the upper house of parliament, the Senate, passes a new electoral law. The opposition-controlled Senate is blocking a bill that would give greater political power to Bolivia's indigenous majority, to which Mr Morales belongs. Fourteen special indigenous electoral districts would be created in places where Indian groups are in a minority. The opposition says the bill would help the re-election of Mr Morales. Tensions flared last week when members of the governing party, which controls the lower house, clashed with the opposition over the bill. The Andean nation has been marked by decades of political upheaval. A new constitution designed to give more rights and a greater share of the land and resources to the country's indigenous majority was approved by more than 60% of voters in late January. But tensions and deep division between the poorer, indigenous majority located in the highlands, and the wealthier and mixed-race lowlanders, have increased since Mr Morales took office three years ago, the BBC's Andres Schipani reports from La Paz. "Faced with the negligence of a group of neoliberal lawmakers, we have to take this step," Mr Morales told reporters at the presidential palace in La Paz on Thursday. "Now is the best time to force opposition senators in the National Congress to approve the new law." The electoral law would set the next presidential election for 6 December. Members of the presidential cabinet pledged to join Mr Morales in his hunger protest but a palace spokesman ruled out a solidarity strike, to ensure the country continued to function. Fernando Mesmer, a member of the influential centre-right opposition party Podemos, dismissed the president's hunger strike as "ridiculous". He said that the ruling Movement for Socialism wanted to ensure the president's re-election in order to "cover up the massive corruption". 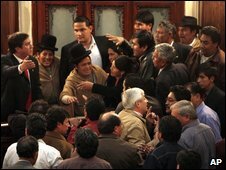 An opposition senator, Walter Guiteras, called Mr Morales' action "shameless". "Congress is absolutely independent of the executive branch," he said. "We think that the president is blackmailing via the strike. Hunger strikes can't be used within the logic and dynamics of democracy, within the terms of the coherence of law, to try to get something. It seems absolutely shameless to me."